As promised, this post is dedicated to Westminster’s final night of recruitment. I seriously remember this day like it was yesterday. Leigha, Athena, and I made a pact that we weren’t going to tell each other which sorority we would write down on that card in the chapel. The parties concluded and we made the dreaded (but exciting!) walk to Wallace Memorial Chapel to make our final decisions. Leigha, Athena, and I sat in different areas staring at this blank card. Athena and I probably turned ours in around the same time. Leigha took a little longer. 🙂 But she eventually turned it in, as well. Seriously after turning in that dang card, I felt like I could breathe and relax again. Trying to fall asleep that night was hard too because all you’re thinking of is… will I get a bid from the sorority I wrote on that card?! Cut to pick-up day – holy smokes – I SO wish we could all go back to that. Leigha and Athena’s dorm floor was called before mine to go on the stage. They both flipped their cards ZTA. Then my hall was called. I think girls thought I would have flipped ZTA just because the three of us were attached at the hip. Well, nope. I flipped AGD, and I am so beyond happy that I did. 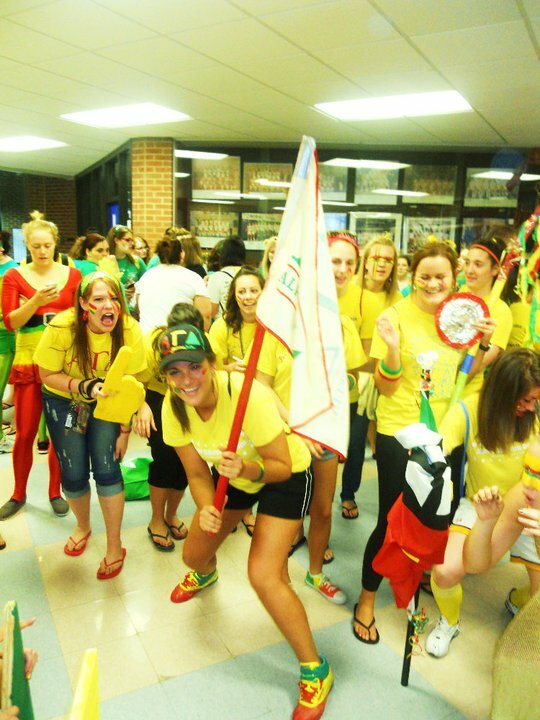 I think I knew from the beginning I was meant to be an Alpha Gam, but it was still nerve-racking nonetheless. I think the moment that made me honestly realize AGD was the sorority for me, and I’m not even kidding about this, was one of their informal parties in October my freshman year. It was Halloween themed and one of the sisters, Rhiannon, was dressed in a garbage bag for who the heck knows why, but I thought to myself… these girls can totally be themselves and are here to have fun but are equally just as nice without being too ‘OMG WE’RE SO HAPPY TO HAVE YOU HERE.’ Like okay, you don’t even know me. I just knew I could be my weird self in AGD. And come on, their animal is a squirrel. That ish is funny. And I do really believe in AGD’s purpose: Inspire the Woman. Impact the World. But any who, those hosting the final night parties tonight, especially you seniors, give your sisters a big hug and take it all in. You’ll be missing it once you graduate! And those of you reading this going through recruitment, please just be true to yourself and follow your heart. The rest will all fall into place. That is my piece of advice to you, and I wish you the best of luck in finding your missing piece. I promise to have a more well written post about this come Friday but seeing current Westminster College (WC) students posting about the start of recruitment week tonight is making me very giddy! Going through recruitment as a freshman was definitely nerve-racking but at the same time so very exciting. I came out of that week learning a lot about myself and my friends. And from the already in AGD side I learned how to host a party and became comfortable and confident to talk to a large group of girls I had never met before. People can bash sororities all they want – and yes, there are some chapters at certain schools where my mind is blown by what they do – but the sororities on Westminster’s campus were comprised of some of the best and most loyal, compassionate, and caring girls I’ve ever met. And I’m talking about all sororities. Not just AGD. The philanthropic nature of the five sororities was also unlike any other. Yes, we all had our rivalries, especially during Greek Week, but overall I can only speak highly of Greek life at Westminster College. I’m keeping this short and sweet so I don’t get too emotional, but I wish all freshmen girls going through recruitment this week the very best of luck. Have fun. Dress nicely. Eat the free food – obviously. And just be yourself. It will make the whole process that much easier when you’re deciding where you belong. And to those girls hosting the parties, same advice to you too. 🙂 Good luck! First day of classes. And for some of you seniors, it’s the last first day of classes. Well, unless you go to grad school. Aside from all of the social events and Greek life functions I was involved with, the classes were just as memorable at Westminster College. One of the main reasons I chose WC was because of the small class structure. For those who know me, I love being in the know, want to be told if I’m doing something incorrectly and praised if I’m doing something correctly. The last attribute is something I should probably work on but that’s me so take it or leave it. But truly the professors at WC did all of those things, which really helped shaped my work ethic and overall being as a student and now as a professional. I started Westminster College as an education major with a Spanish minor. That’s right. I wanted to teach high school Spanish, but I quickly learned that I did not have the patience (and still would not) to teach the youth. Especially teenagers. I know if there was any attitude or smart-mouthing going on, I would give it right back and then probably get fired. So I switched to a public relations major but still kept the Spanish minor. Now I see there’s a social media minor – quite jealous of that! I’m so envious of those who get to start classes at Westminster today. I’m envious of the freshman for beginning what is to be the best four years of your life, of the sophomores and juniors because you are really getting into your major/minor and making wonderful connections with classmates and professors, and super envious of you seniors. It was such a bittersweet time starting that final year, knowing it was coming to a close but also sort of being able to do whatever the heck you wanted since you were on top of the WC food chain. So many of the things I learned in my classes at Westminster College have been applicable in the real world and especially in my current job. From the freshman year writing and public speaking courses to the required gym classes (I took WC’s version of water polo – #SPORTS), to the cluster courses, and your required major classes, I am grateful for the professors I had, the connections I made, and the real-life experiences and coursework Westminster offered. Please don’t take any of it for granted! And what’s really great is seeing all of my fellow Titans on social media all across the country with epic jobs and knowing that what helped us get these jobs is the education we received at Westminster College. I know the running joke will always be “$40,000 a year blah blah,” and while I’m in debt up to my eyeballs, I wouldn’t trade my education at WC for anything! *The picture at the top of this post is me with two very dear and first friends of mine at Westminster – freshman year in Shaw. …til Greek Week. That was the motto of Alpha Gamma Delta each year leading up to the best week of our lives, which is currently going down at Westminster College. Talk about a perfect #tbt. For those unfamiliar, let me break down what the week entails. SPORTS. Lots of sports. Since I’m an all-star athlete and didn’t want to show off my talents among the other members of the Greek community, I stayed on the sidelines during events (pictured right), giving my fellow sisters a chance to participate. False. We wouldn’t be on this 16-year winning streak if I even attempted to partake in any of the events. You’re all welcome. And yes, you read that correctly. The sisters of the Alpha Epsilon chapter of Alpha Gamma Delta have won Greek Week 16 years in a row, and I couldn’t be MORE proud to be a part of this organization. Red, buff, and green – what what whaaaaat. While the bond of sisterhood in general is quite strong, the bond that occurs during this single week is something I cannot explain, and I’m sure this goes for you other Greeks out there, too. But I’m telling you. Something about Alpha Gamma Delta. Few things make me emotional, but thinking back to all of this… CAN I GET A TISSUE. I am so proud to call these girls my sisters, both ones I went to school with and current ones whom I’ve never met (yes, that sounds creepy, but you completely understand if you’re Greek). With their determination, pride, good sportsmanship, and talents, I am not surprised we have won 16 years in a row. Sisters, I leave you with this song. It is sure to pump you up before, during, or after any event and especially before you leave the suite on Saturday night to head over to Orr Auditorium. Jillian and Lindsay can attest to that (10, 10, 10, 10!). So good luck to all Greek organizations this week but most importantly, good luck to my sisters of Alpha Gamma Delta. I hope you squirrels bring home another win, and I hope you crush it on stage Saturday night. Wish I could be there.